We take a look at Canon's top of the range full frame Digital SLR which promises the ultimate in image quality and speed. 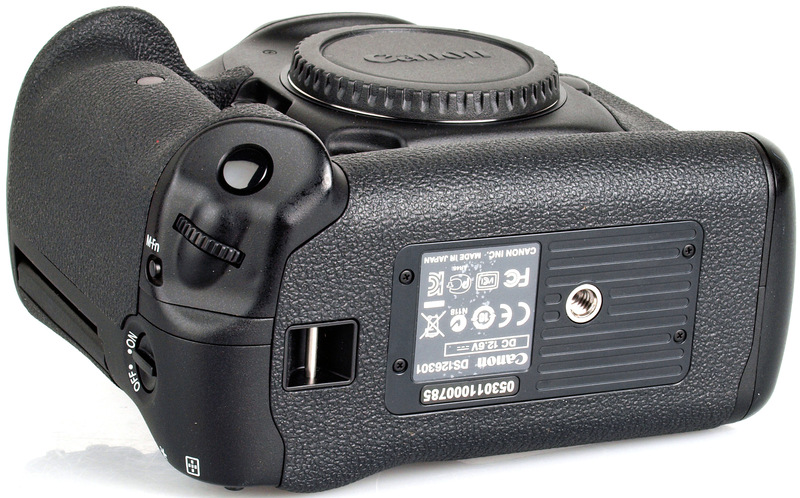 Announced in October 2011, the Canon EOS 1D X is the high end full frame Digital SLR from Canon with a professional weather sealed body, it was expected to be available to purchase in April 2012, however this was delayed until mid-June 2012 with the actual sale date later still. 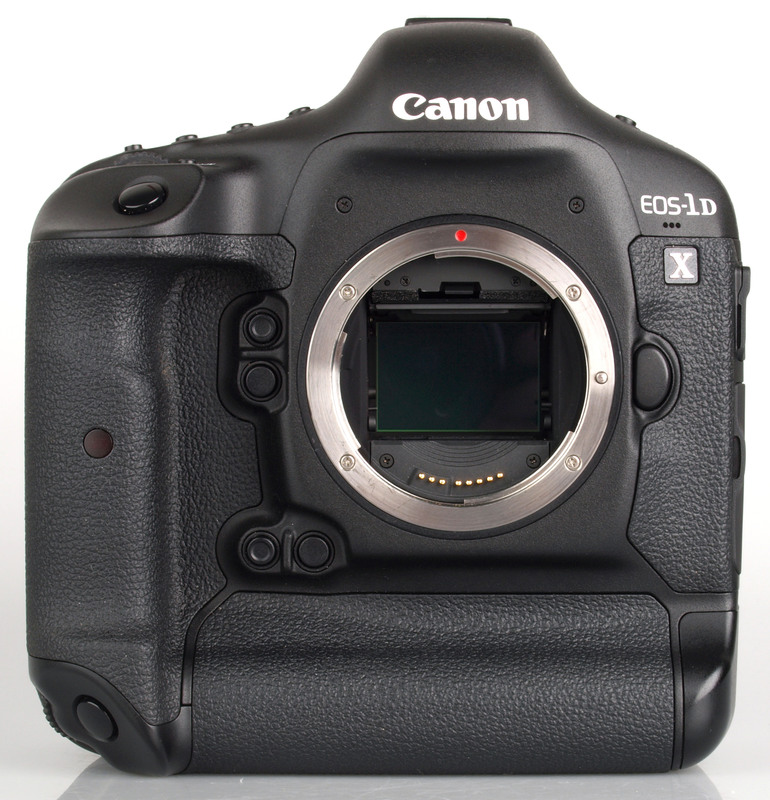 However, despite these delays, the Canon EOS 1D X is currently available to purchase from a number of stores, with the camera showing as in stock, so any of these early release issues should now be firmly behind Canon. The Canon EOS 1D X is the fastest shooting professional full frame Digital SLR shooting at 12fps in JPEG/RAW or 14fps in JPEG only mode. Faster than the 11fps offered by the Nikon D4, the next fastest shooting full frame camera, with the next quickest after this being the 6fps shooting Sony Alpha A99. The Canon EOS 1D X takes the best of the EOS-1D and EOS-1Ds and is said to combine them into a single unit that gives both high resolution and high speed shooting, although compared to the Canon EOS 1Ds MKIII it sees a reduction in resolution from the 21.1 megapixels down to 18.1 megapixels, and an increase from the 16.1 megapixel APS-H (1.3x crop) sensor in the Canon EOS 1D MK IV. The 18.1 megapixel full frame CMOS sensor has larger pixels than the EOS 1D Mark IV, and is the first full frame sensor from Canon to feature gapless microlenses to draw more light into the sensor. The ISO range goes from ISO100 to 51200, but is also extendable to ISO50 up to ISO204800. The 1D X promises improved image noise reduction at higher ISO speeds, a wider dynamic range and has a 16-channel readout. Optional WFT-6 Wi-Fi unit, and GP-E1 GPS unit. Handling - The camera feels extremely well built with a re-assuringly solid and sturdy construction, with ample rubberised grip whether using the camera in portrait or landscape mode. The rubber eye-piece around the optical viewfinder is larger, and the view through it bright. To anyone who's used a previous Canon EOS 1D the layout of controls and buttons should be immediately familiar, and rather than having an optional battery grip, the Canon EOS 1D X has a built in battery grip, which has allowed quick access to controls whether you are using the camera in landscape or portrait mode the camera now has two mini "joysticks" to move through options. In addition the two front buttons have been replicated for use in portrait mode as well. The rear scroll wheel surrounding the SET button can be used whilst recording videos and is touch sensitive so that the video doesn't pick up any noise from using the control. 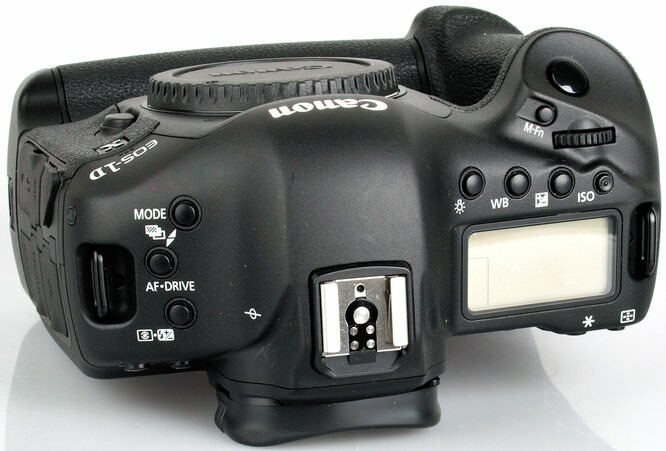 In low light, it would be useful if the buttons illuminated, like the Nikon D4, with just the top LCD illuminating when you press the light button. Unfortunately this is not marked in any way, such as with a dimple or dot, so finding this in the dark can be difficult unless you are used to the camera, instead the ISO button has a dot so that you can find it. 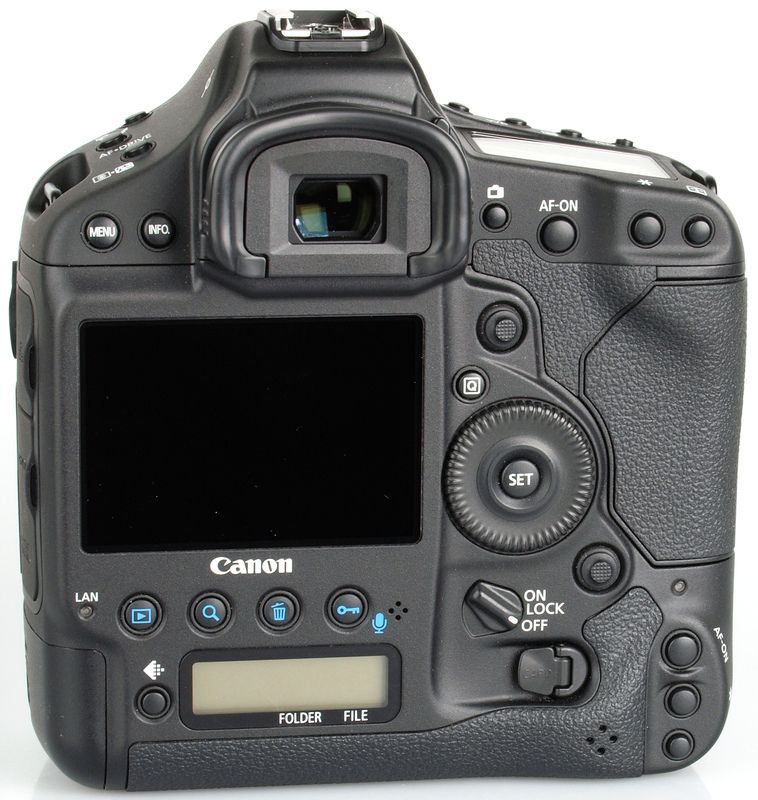 Menus – The Canon EOS menus are clearly laid out with each section colour coded and will be familiar to anyone who's used Canon's recent Digital SLRs. You can watch a menu walkthrough video on our YouTube channel, where you'll find a vast array of options. Auto ISO options are advanced giving you the choice of minimum and maximum settings in manual or auto ISO, although when setting auto ISO, there is a note that pops up letting you know that maximum continuous shooting speed is 10fps if ISO32000 or above is selected. The camera gives excellent customisable options for the dual CF card slots, including the ability to auto switch to the other card if one is full (unlike the Sony Alpha A99), you can set different images to go to each card, or photos to record to both cards. 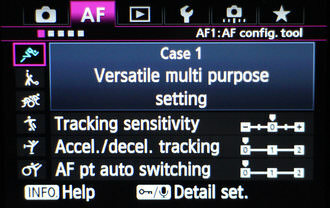 AF options - there are 5 pages of Auto Focus options including case examples, and Canon has provided a 48 page guidebook available for download. 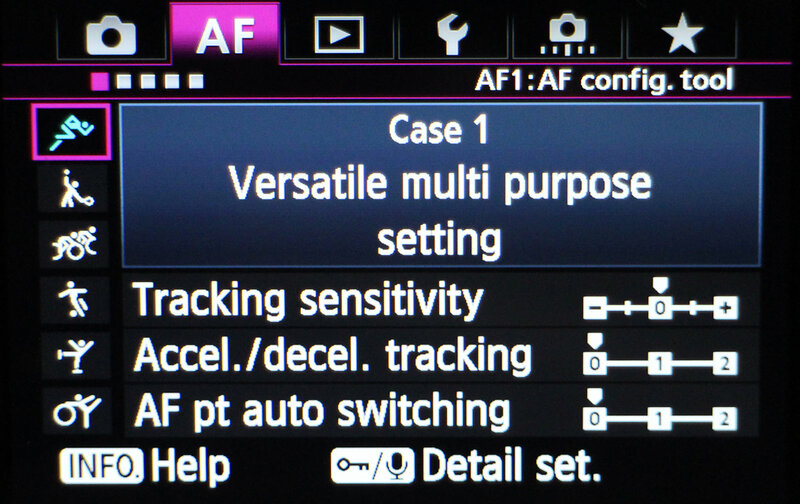 The options give you control over tracking sensitivity, acceleration / deceleration tracking, and AF point auto switching, and there are four other pages of AF options. Battery life - Battery life is rated at 1120 shots according to Canon / CIPA test results, we were able to take 1613 shots before the battery went flat. 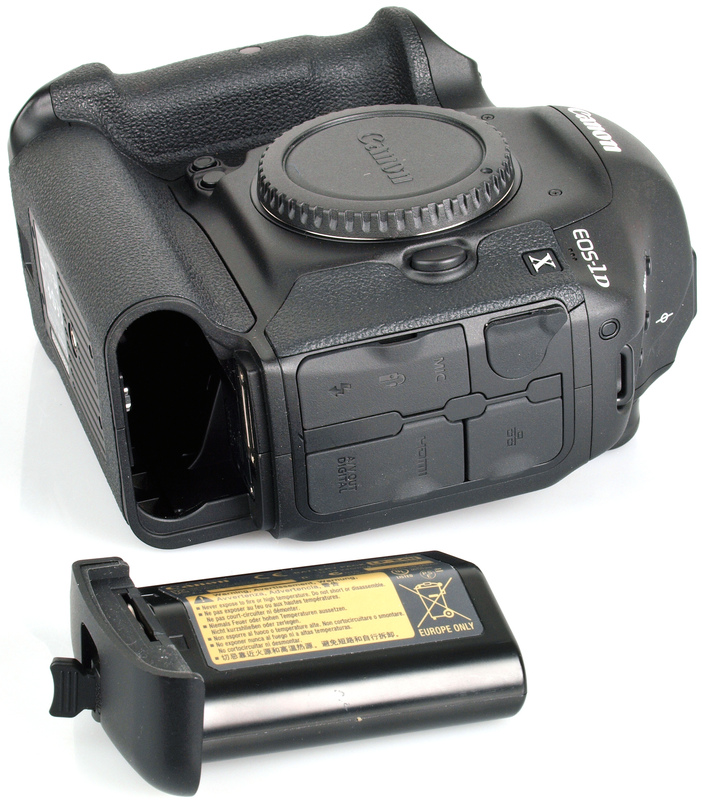 This is decent, although half that of the Nikon D4, and it's not possible to add another battery grip as you would with a smaller DSLR to improve battery life, instead you will need to purchase a second battery for around £149. The camera provides extremely fast focus and shutter response when tested with the new Canon 24-70mm f/2.8 L II USM lens, although using the live view mode is noticeably slower. The camera is ready to shoot very quickly after switch on, and shot to shot times are excellent. Continuous shooting is impressive at roughly 10-11 fps shooting JPEGs (in 12fps continuous shooting mode), we were able to take around 290 shots before any slowdown, tested with Sandisk Extreme Pro 90MB/s UDMA6 card*. Shooting RAW it's possible to shoot at 11fps, although the number of shots is less, with 34 possible before slowdown. In H14 mode, it's possible to shoot at 12fps however this is JPEG only, and we were able to take 36 before slowdown. *Results were no quicker with a UDMA 7 card. Sample Photos - The Canon EOS 1D X performed extremely well in our studio with excellent detail and colour. The camera was able to shoot in extremely low light, and in a variety of weather conditions, with successful focus and impressive results even using high ISO settings, although converting the RAW image it's possible to improve image quality. Lens Performance - Shooting wide open vignetting is visible when using the lens, and with a full frame sensor the camera is less forgiving of lens performance. Focus is extremely reliable in a variety of lighting conditions. The lens used is resistant to flare, and provides sharp results throughout the zoom range. Exposure is good although does prefer to under-expose rather than risk losing highlight detail. ISO Noise Performance - ISO ranges from ISO50 all the way to ISO204800, with expansion enabled! Comparing the Canon EOS 1D X to other full frame Digital SLRs, such as the Nikon D4, Canon EOS 5D MK III, and others, including the Canon EOS 6D, the 1D X has lower noise than these other cameras, and shows clean results up to and including ISO12800 and even ISO25600. The camera has particularly impressive performance at high ISO levels, with even better results available when processing the RAW files. White Balance Performance - Auto White Balance (AWB) under tungsten lighting, as well as the tungsten preset give a warm result. AWB performs better under fluorescent lighting with an neutral result, and this gives a better result than the fluorescent preset. Outdoors, depending on light, the AWB can give a cooler look to the image compared to other cameras, and use of RAW is recommended to enable full control of the colour temperature after shooting. Digital Filters - Here you can see the default colour presets available, each one lets you customise the sharpness, contrast, saturation, and colour tone, with three user defined settings available, and an Auto setting. Video - ALL-I, and IPB compression options are available, as well as timecode ability. Mono audio recording is built into the camera, with a 3.5mm stereo input jack providing support for stereo sound. Manual audio level control is possible while recording. 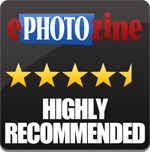 Additional Canon EOS 1D X videos can be viewed on ePHOTOzine's YouTube channel. The Nikon D4 is available for around £4249, while the Canon EOS 1D X is available for £4849, roughly £600 more than the Nikon D4. If you already have any investment in lenses, then this may play some part in whether you invest in this system or the other, as the Canon EF 24-70mm f/2.8 L II lens used for testing is available for £1899, while the Nikon FX 24-70mm f/2.8 G equivalent is available for £1219, a further saving of £680. If you're looking for the ultimate in speed, image quality, and performance, as well as exceptional low light performance then the Canon EOS 1D X certainly delivers in abundance. With extremely high ISO settings available it's possible to shoot in low light situations hand-held where you would normally have to setup a tripod and timer, as long as you don't mind using these higher ISO settings. The high speed continuous shooting, focus, and ability to use ISO settings with high shutter speeds would ideally be suited to wildlife, sports, low-light or other areas where speed is paramount. The high price tag puts this camera firmly in the professional photographer market, or for those who have ample money to spend on the best available, and the weather sealed body certainly gives a high quality feel to the product. This should be re-assuring to those that invest in the camera, as well as the 2 year warranty provided by Canon. It's probably also a number one choice for any paparazzi photographer who needs to know they can get the shots regardless of lighting or weather conditions, although the maximum shooting speed we got out of the camera was 12fps. The Canon EOS 1D X gives the best low light high ISO performance of any full frame Digital SLR yet! One of the biggest negatives about this camera is the price, with the Canon EOS 1D X being one of the most expensive full frame Digital SLRs available, however, for those seeking the ultimate in speed, and low light performance, the price will be justified, assuming you have the budget for it. 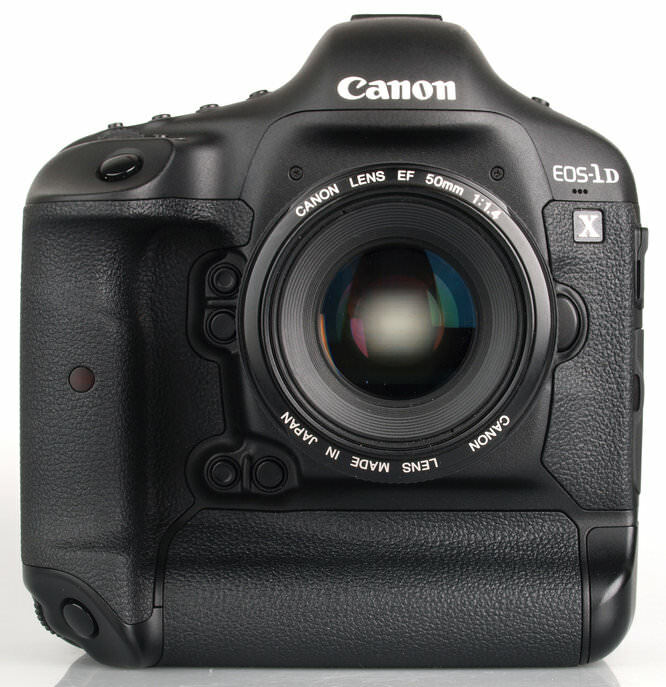 The Canon EOS 1D X delivers exceptional high ISO performance and for those that need the speed, this camera delivers. There is nothing "wrong" with this review. It is not what I regard as in-depth :( Just one example - it does not go into any detail about focus tracking ability with a camera who's intended market includes professional sports photographers. You feature the fps being the same as the Nikon D4 in RAW. I was under the impression most professional sports photographers shoot mainly jpeg for speed of transmission; making the higher JPEG fps a significant feature. I would prefer a review which concentrated more on the likely end use of this top "action photography" camera. There is nothing "wrong" with this review. Just one example - it does not go into any detail about focus tracking ability with a camera who's intended market includes professional sports photographers. You feature the fps being the same as the Nikon D4 in RAW. I was under the impression most professional sports photographers shoot mainly jpeg for speed of transmission; making the higher JPEG fps a significant feature. I would prefer a review which concentrated more on the likely end use of this top "action photography" camera. Quote:You feature the fps being the same as the Nikon D4 in RAW. I was under the impression most professional sports photographers shoot mainly jpeg for speed of transmission; making the higher JPEG fps a significant feature. We've shown the speed of shooting in JPEG High speed, JPEG 14, and RAW to cover all options. Despite using JPEG 14 - which is supposed to shoot at 14fps - the highest speed we could get out of it was 12fps. This is in the Speed section - and the table has been updated to make this clearer. We'll add some action shots tomorrow. Thanks. Not ready to upgrade from EOS1D Mk4 just yet. Its still too expensive. "Lacks in camera HDR of following models" Why would that even be considered on a Professional £5K camera. It shouldn't have gimmicks in the first place. Well done Canon!!! "Lacks in camera HDR of following models"
Why would that even be considered on a Professional £5K camera. It shouldn't have gimmicks in the first place. Hi all, I was under the impression that the 1Ds Mk3 is quite a bit more expensive than the 1Dx. However, does anyone here have experience with both? I did see a comment passed in another forum where the person reckoned that the 1Dx 'did everything the 1Ds 3 did but with much less fuss'. Can anyone corroborate this? Comments would be highly appreciated! 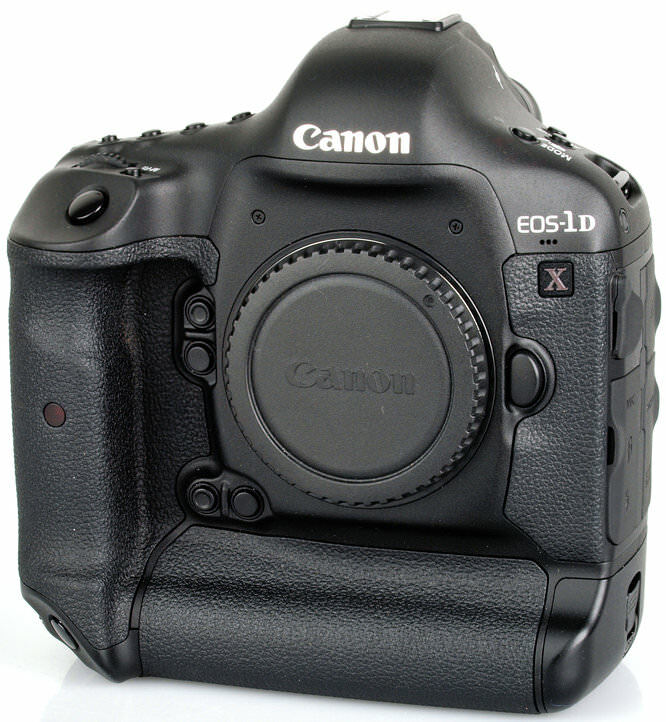 I was under the impression that the 1Ds Mk3 is quite a bit more expensive than the 1Dx. However, does anyone here have experience with both? I did see a comment passed in another forum where the person reckoned that the 1Dx 'did everything the 1Ds 3 did but with much less fuss'. Can anyone corroborate this? Comments would be highly appreciated! 1Ds is over 5 years old has 21mp & 5fps more suited for studio. against 18mp on the 1Dx. & 12 fps more suited for wildlife. I'm calibrating a 1Dx to the 500MM lens in the next few days & hope to have more info. 1Ds is over 5 years old has 21mp & 5fps more suited for studio. against 18mp on the 1Dx. & 12 fps more suited for wildlife. I'm calibrating a 1Dx to the 500MM lens in the next few days & hope to have more info. Basically it's very good and very expensive. I don't have the numbers to compare it handy but I reckon it's a camera for a very specialist market (sports photographers). I suspect that if someone takes under consideration the combatibility and the number of the available lenses, the weight and the guarantee (Leica passport) may choose Leica's M9. I have a 1Dx and it really is an all round camera, the quality of the 18MP is just as good as if not better than cameras sporting more MPs. Portraits come out the camera perfect for studio work but the big plus in my book is the ISO. Untouchable by any other camera around meaning I can shoot macros at high ISO handheld and still maintain perfect quality. Sports and wildlife of course benefit big time from the ISO and the superb autofocus capabilities again unmatched in my opinion. This is an unbiased opinion, this is the first Canon I've ever owned I'm not swung by marketing, just performance. There is a downside however, one I haven't experienced yet but there have been may cases of oil getting on the sensor when shooting at high speed. 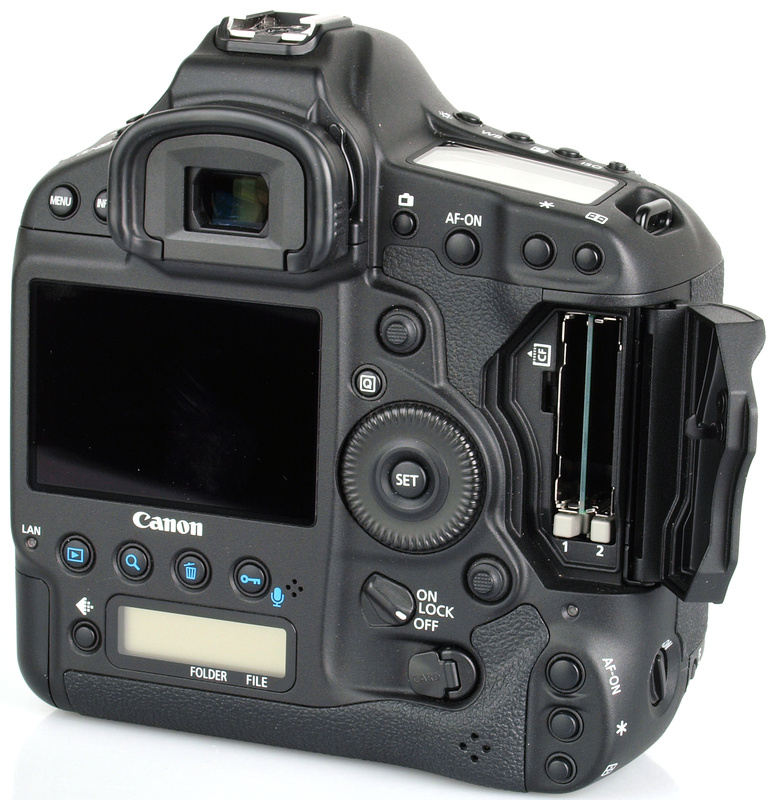 This is an issue that was affecting earlier models of the 1D too apparently and still no fix and as yet no admittance to the problem by Canon on this model.